It is wedding etiquette 101. Some people need a constant reminder of when and where the wedding will be to help them plan the day, and to be honest if they had to keep all of the information for themselves, you might end up with only a select few people at your wedding, as the correct information can easily be heard or written down wrong. Where Do You Get Invitations? You can make invitations by hand, but this can be a bit time consuming. Almost all stationery stores will have invitations for you to purchase. Usually they have a catalog that you can go through to pick the kind of color, border, ornamentation, and paper that you want to use. If you can’t find an invitation style that you like in the catalog, then there are businesses focused on wedding invitations that will be more than happy to give you exactly what you are looking for. Keep in mind that they may cost more than a stationery store, so make sure that you compare prices and make a decision based on your wedding budget. 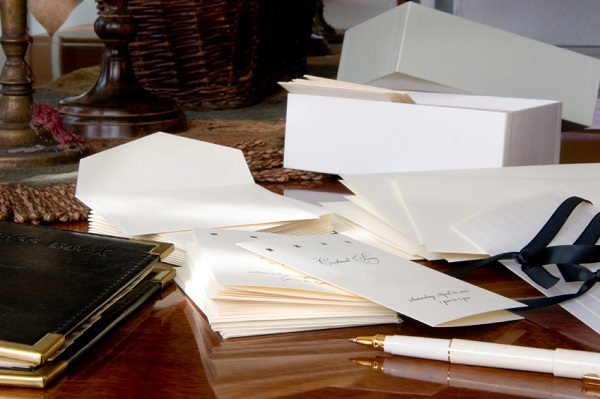 If you don’t plan to write the invitations by hand, and you have the option to pick a printing method, then it all boils down to preference and cost. There are many different ways that the words can be printed onto the paper, and it goes far beyond the printers we have attached to our computer at home. Engraving: This is an elegant form of printing, and it is the most traditional print method for wedding invitations. This is also the most expensive form of printing invitations. The paper receives a stamp of the words you have requested on the back of the paper, which creates raised words on the front of the paper. Thermography: In this method, a special press heats the ink and the printer creates a raised-letter effect that looks a lot like engraving. The good news is that this method costs about half as much as engraving. Calligraphy: If you like the look of calligraphy, you no longer have to hire a calligrapher or do it yourself. There are printers that can recreate the elegant calligraphy look and feel. Many invitations in catalogs will come with the words already perfected for you. However, if you want to write your own words, that is perfectly acceptable as well. While that is traditional, you can do whatever you like on the wedding invitation. For example, you can use the bride and groom’s name only or use the name of the person or people helping out with the wedding the most: the father of the bride, the father of the groom, or the father of the bride and the mother of the groom. Lastly, you will need to choose envelopes that the invitations go into. The selection ranges from simple to fancy, and you can find them at your local stationery store as well. In fact, you will probably pick them out when you pick out the invitations to ensure that the invitations will match the envelope and fit. Remember though, when it comes to envelopes, your guests are just going to throw them away once they open them. Therefore, you may want to invest more money into the invitation than the envelope.